I often discuss the importance of long-run growth and I pontificate endlessly about the policies that will produce better economic performance. But what about short-term fluctuations? Where are we in the so-called business cycle? I don’t think economists are good at forecasting the ups and downs of the economy, but I did mention the factors that might contribute to a downturn in this interview with Dana Loesch. Dana isn’t the only one interested in this topic. The New York Times opined today about the state of the economy. …the American economy has a lot more power…, and it’s making a lot of noise. …While Mr. Trump praised himself effusively…the stock market seemed unimpressed. …That’s because if you look down the line, there are few clear reasons to be so enthusiastic. I suspect the editors at the NYT are somewhat motivated by a desire to make Trump look bad, but I don’t necessarily disagree with some of their analysis. Though I think they are wrong on tax policy, which is the best thing that’s happened since Trump took office. …the initial jolt of the Republicans’ $1.5 trillion tax cuts, mostly for corporations and the wealthy, is wearing off. Corporations have bought back $437 billion of their own shares, which leaves them that much less to invest in new production, or wages. By the way, there’s nothing wrong with stock buybacks. It’s a way for companies to return profits to shareholders. And those shareholders generally then reinvest the money, so the NYT screwed up on that bit of analysis. But they raise a very legitimate issue when looking at the impact of monetary policy. Then there’s the flattening yield curve, which the St. Louis Federal Reserve’s president, James Bullard, warns could invert late this year if current conditions persist. That means short-term rates, such as those for two-year Treasury bonds, run higher than long-term rates, like the 10-year bond, a sign of pessimism that is a well-known red flag. Though I would add that we wouldn’t be in the position of having to raise rates if the Fed hadn’t pushed rates artificially low in the first place (the same mistake they made last decade, by the way). The NYT editorial also looks at consumer spending, which is fine if the goal is to see whether retailers are happy. But if the issue is whether the economy is doing well, it’s much more important to see whether personal income is rising or falling. Consumers were in a spending mood this spring, an attitude that won’t necessarily continue. …A recent Reuters analysis found that the bottom 60 percent of income-earners have been fueling their spending, and thus the economy’s, by using their savings or credit cards. They almost have to, because wage growth is expanding at a disappointing 2.7 percent annual clip. I fully agree with this excerpt about trade. Assuming he wants to run for reelection, Trump is being very foolish to push for more protectionism. …consider the administration’s effort to apply the sledgehammer to the economy’s toes via a trade war and ensuing tariffs on imported steel and aluminum, among other products. …Not only have the tariffs contributed to $1 billion in higher costs for General Motors, they are now contributing to rising prices of everything from Cokes to vacuum cleaners as companies pass along those costs to consumers. Last but not least, I don’t necessarily agree that expansion have to end. After all, the economy is largely capable of self-correcting. But a “business cycle” is probably inevitable so long as government has so much power to intervene. None of these issues by themselves will put the brakes on an economy that is powering along with a 3.9 percent unemployment rate. But the friction is building. …economic expansions — and this one is in its 10th year — eventually run out of gas. …Mr. President, while you like to take credit for positive economic trends that are well beyond your control, you will own the downside, too. For what it’s worth, I think misguided monetary policy usually deserves blame for short-run economic instability. I mentioned in the interview that the central bank is trying to “normalize” interest rates. I hope the Fed is successful, though I worry that financial markets (and housing markets) have become dependent on easy money and will take a hit. I’ll close by pointing out that the pundit class is focusing on whether the economy is growing faster under Trump than it grew under Obama. I don’t care about that contest. I’m much more interested in whether we can get the kind of free market-driven prosperity we enjoyed under Ronald Reagan or Bill Clinton. We didn’t get that growth during the Obama years. And given Trump’s schizophrenic approach to policy, I don’t have high hopes we’ll average 3 percent-plus growth during his tenure. Long term growth does not depend that much on the actions of any one administration but rather on the cumulative integral of policies enacted by many past administrations. Like a country’s economic freedom score does not depend that much on who is in power right now but on what all previous administrations did. For example, Obama may be gone but most of his policies are still around, only s few were reversed. So are many of the Johnson and Roosevelt policies. The bottom line: “Is economic freedom in the US increasing?” Also, “Is it increasing compared to the world average?” The trend in this metric is not very encouraging for America, as American voters have acquired a more European mentality overall — the mentality of the slowest growth continent in the world. The long term trendline does not look that good. America needs a long term economic growth trendline of four percent just to keep its current world economic standing. That being said, the entire world average is getting better at a very fast pace. Standards of living that used to be limited to a few privileged countries are now fast expanding all over the earth. Will America continue to lead or will Americans be absorbed into the world average? Will America continue to expand faster than the rest of the world as it has done for most of its history? 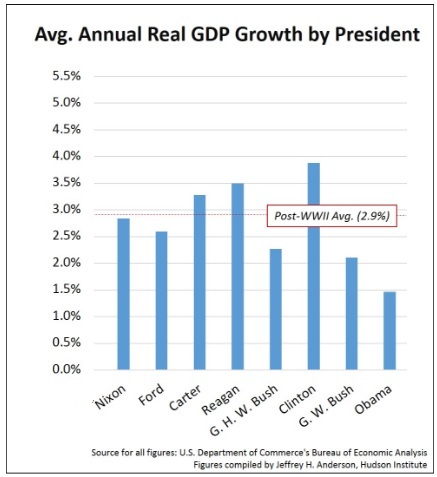 Not at the current growth rate — and definitely not at Obama’s trendline growth rate. Vast sections of the world are essentially copying America by increasing their economic freedom while America has either stalled, or is even backtracking under “progressive” [such progress indeed..] collectivist policies. That is the worrisome trajectory.